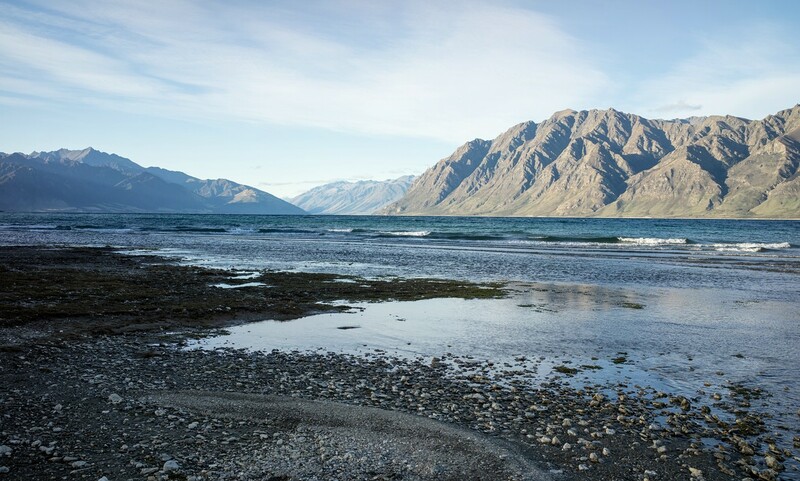 After my hike of Dusky Track, I continued on towards the West Coast taking the road via Queenstown and Wanaka both of which had I already visited before. After Wanaka, I passed Lake Hawea which was worth a photo stop. 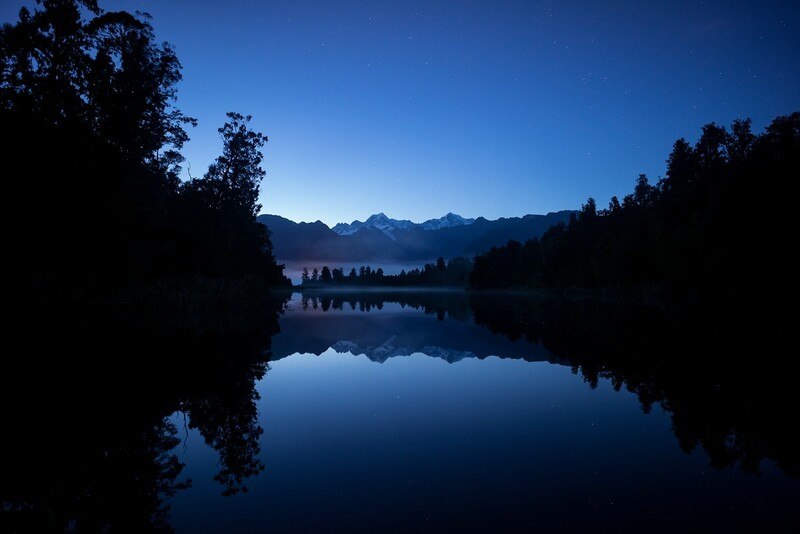 Next, the road follows the border of Mount Aspiring National Park. There are a lot of interesting hiking opportunities but unfortunately my schedule did not permit further exploration. 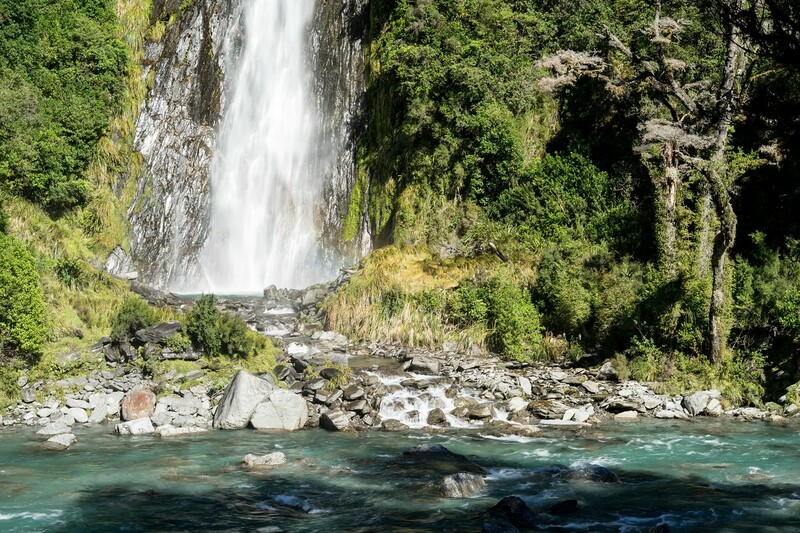 Thus, my next destination was Haast Pass featuring Thunder Creek Falls directly next to the road. You probably can imagine the amount of visitors there. Soon, the coast is reached and the road continues on along the coast in north-eastern direction. At the West Coast the sea is a lot rougher due to the predominant and strong wind from the west. 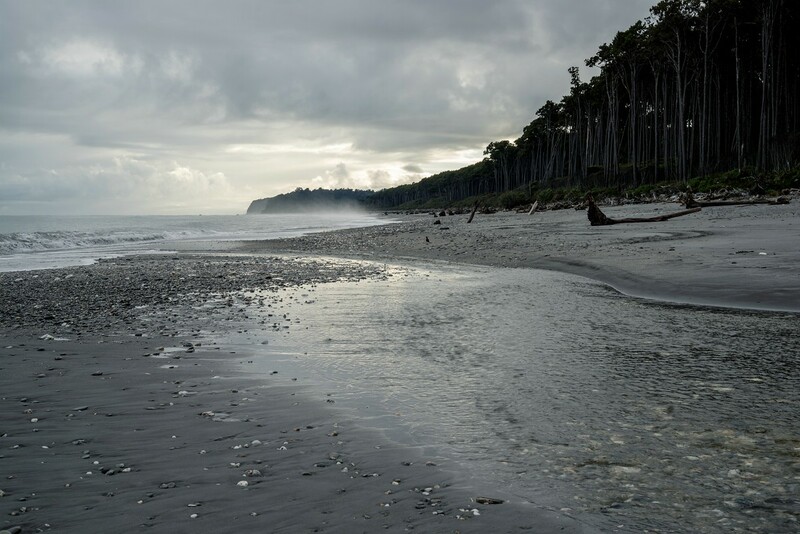 On the beaches a lot of driftwood – including really thick trunks – can be found. The salty sea spray is often filling the air. After Bruce Bay Westland National Park including Fox and Franz Josef Glacier is reached. These two glaciers are *the* tourist attraction on the West Coast. There are two villages that are the focus of the tourism industry with all kinds of offers from helicopter flights to glacier hikes. It is also possible to reach the glaciers by car and on foot. 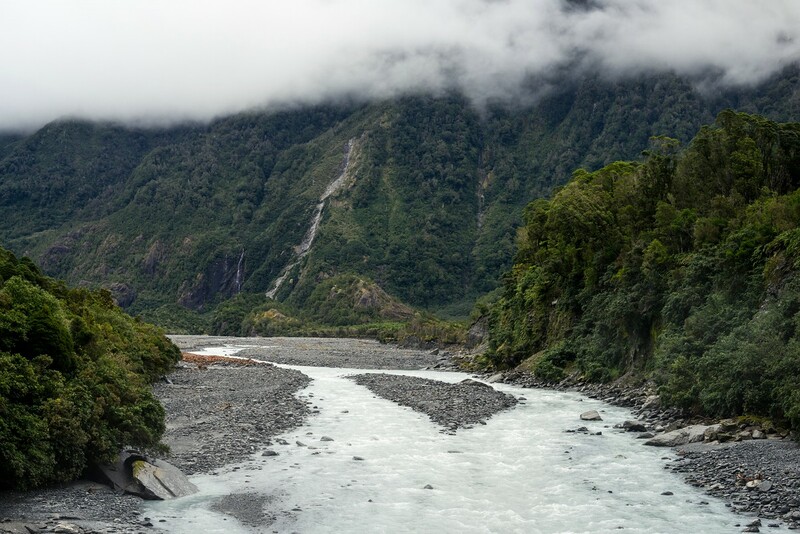 Fox Glacier viewpoint is only a short walk from the car park. 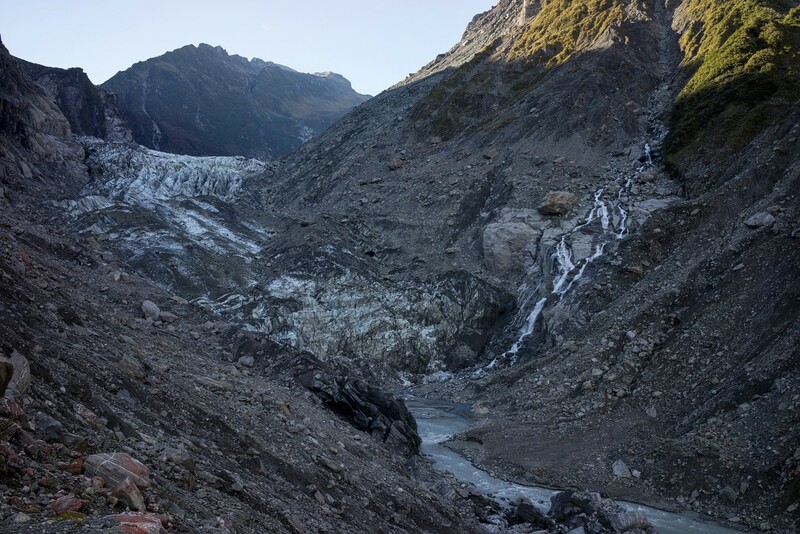 It is evident that the glacier is retreating rapidly and every now and then new trails, parking lots and view points are built for the tourists. Every few minutes, helicopters fly overhead. While the glacier is certainly interesting to see, the constant noise and sheer amount of visitors not only destroys the atmosphere but also has a significant impact on nature. 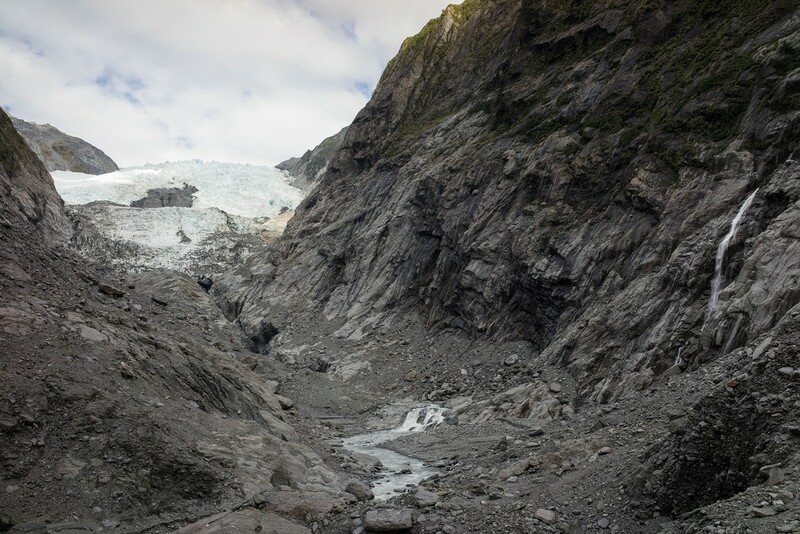 Franz Josef Glacier, named after the emperor Franz Josef I of Austria, requires a 40 minute hike to see the ice. Also this glacier is melting away quickly. In my opinion, some of the side trails in the area are more interesting than the main route – although they do not offer views of the glacier. Also at Franz Josef Glacier you will hear helicopters every few minutes resulting in a constant, disturbing background noise. 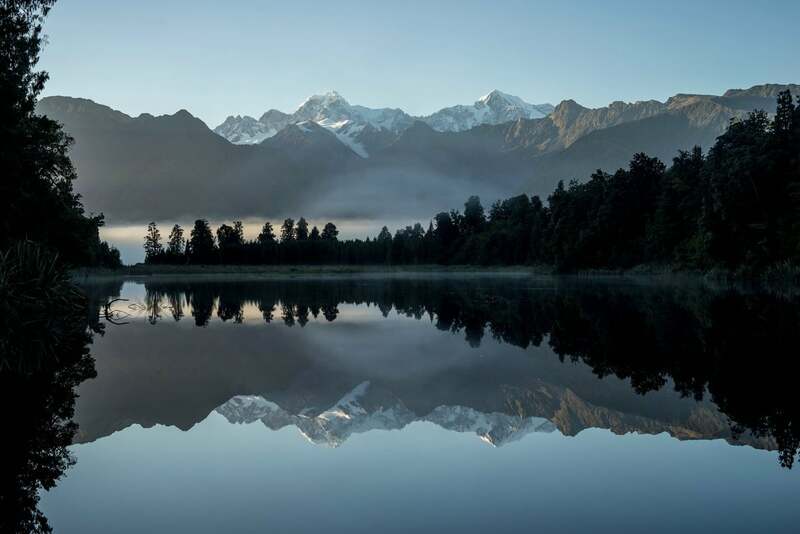 Near Fox Glacier village, Lake Matheson is a famous location for its mirror-image view of Aoraki/Mount Cook. Of course, I did not want to miss such an opportunity. I got up early in the morning while it was still dark, walked along the lake and for a short time, I was alone at my viewing location. However, after a while, I was surrounded by other photographers with tripods and tourists with cell phones trying to get the famous shot. I waited until the sunlight was partly illuminating the landscape. It was a beautiful sight, the fog in the background really added to the scene. In the end, I was happy when I could leave as the location was seriously over-crowded. But at least there were no helicopters! 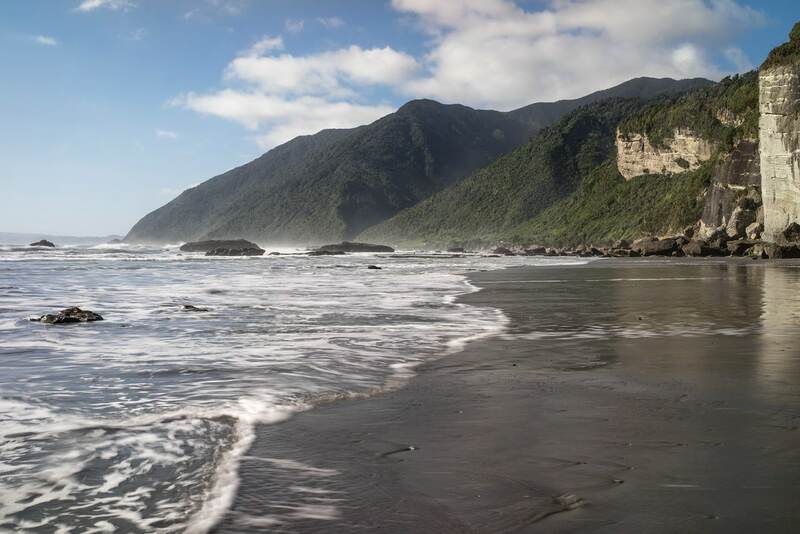 Driving north from Greymouth there are a lot of interesting spots to visit. 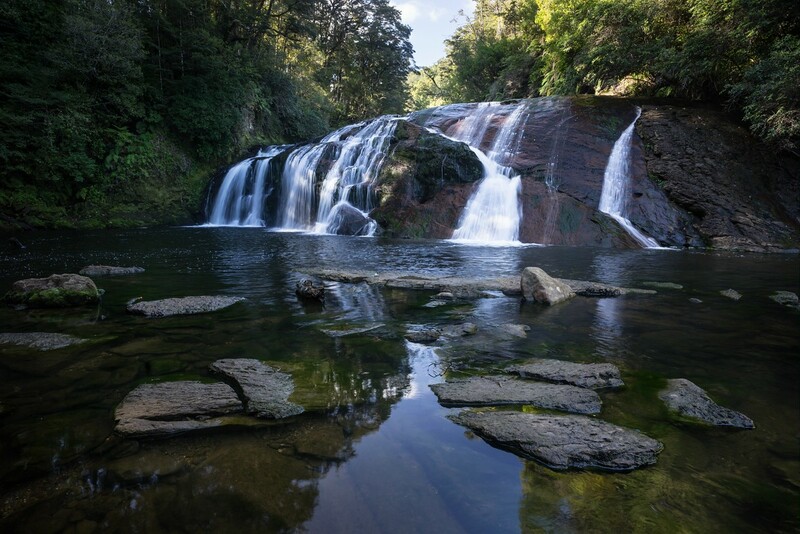 For example, shortly after Greymouth I stopped for a short walk to the Coal Creek Falls, a smaller waterfall where you will not encounter many visitors. 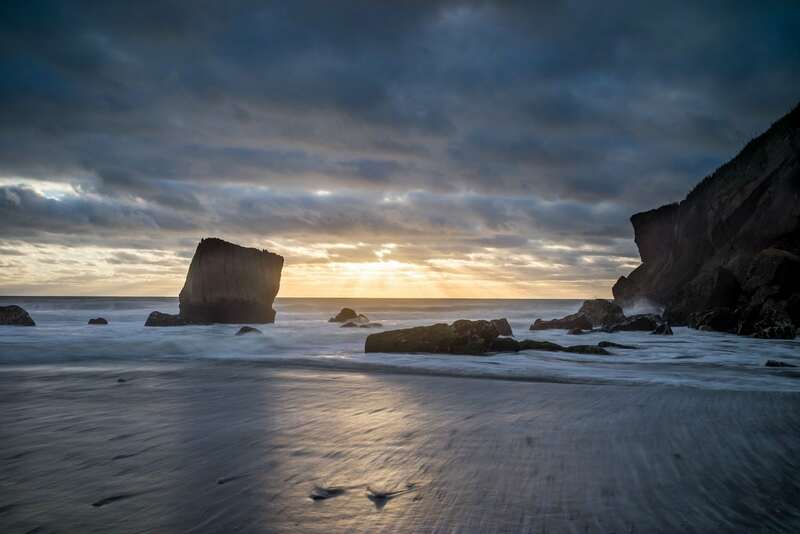 Then, there is Motukiekie Beach that features interesting rock formations and sea stacks. Part of it can only be reached at low tide. Also here, you will be mostly by yourself. This is where all the buses and every car will stop. 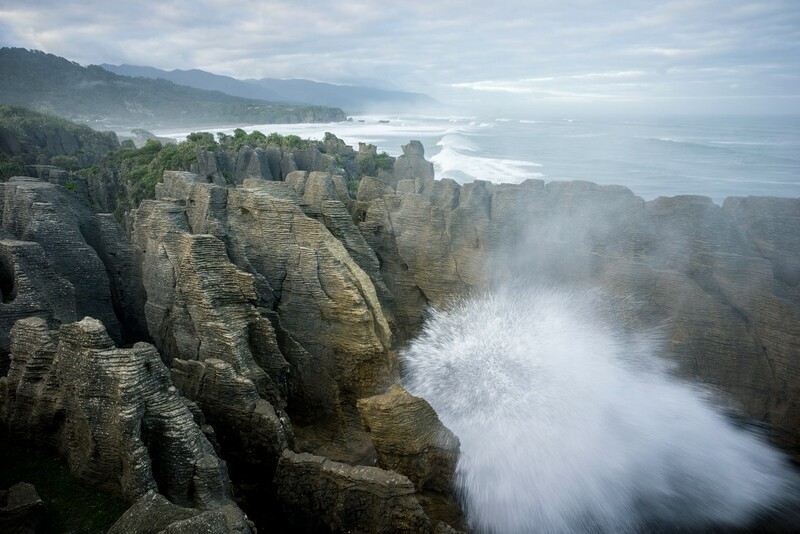 The Pancake Rocks are impressive sea stacks with “blowholes” where you can experience water fountains at high tide. It is worth waiting for the tide as the effects will be much more impressive. I stayed at the nearby campsite and dedicated the whole evening to this location. The next morning I returned because the tide was higher and there were some nice “water explosions” between the rocks. 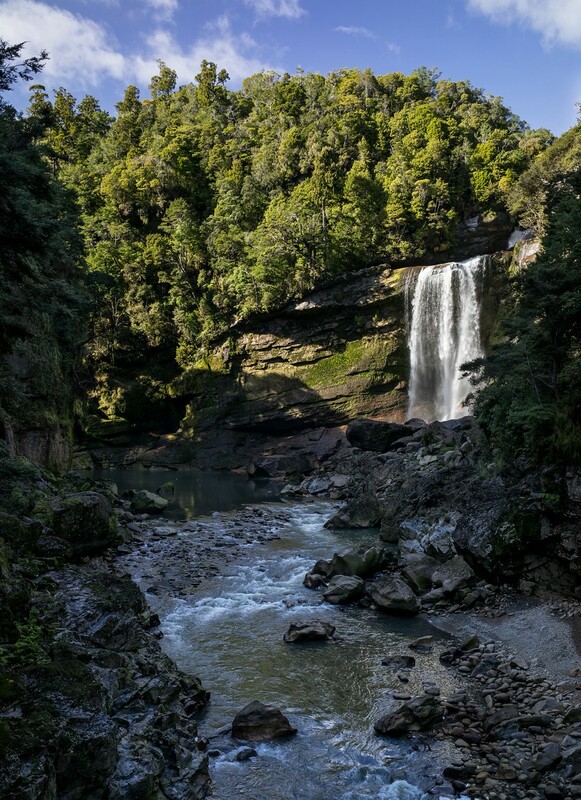 Near Punakaiki there is a trail following the Pororari River through a limestone canyon with jungly vegetation. There is also the option for a multi-day hike from there. 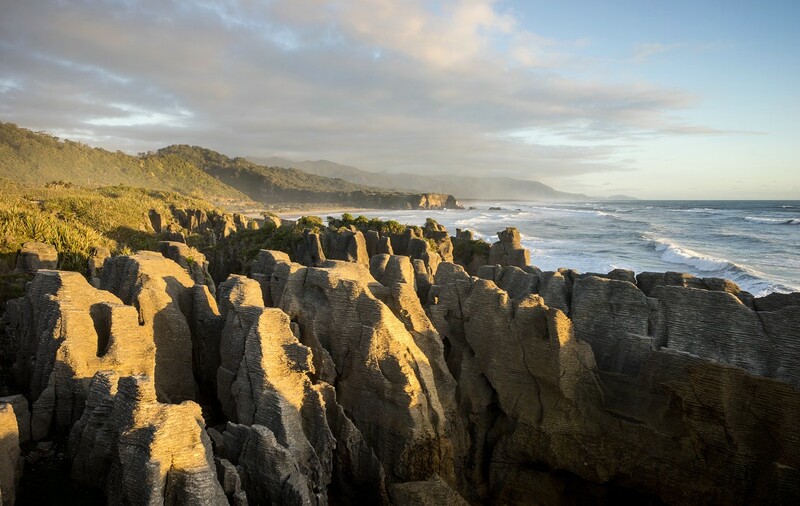 After the town of Westport I continued up north towards Karamea. Along the way I stopped for a walk along the Charming Creek Walkway that follows an old railway track into a gorge and to the beautiful Mangatini Falls. The railway track has a few tunnels, and in some parts it is crumbling due to erosion. At Karamea the main road along the West Coast ends. There is a small DOC campsite at the beach. 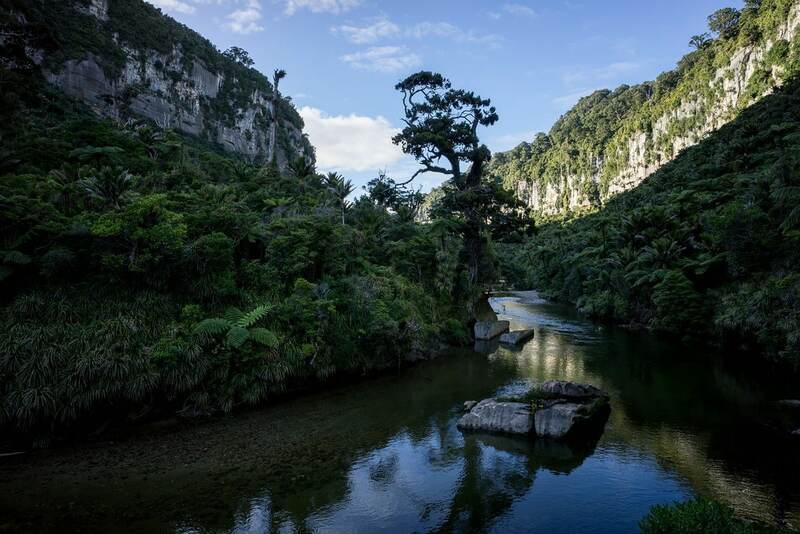 From there it is possible to reach the Oparara Basin which features stone arches and gateways. 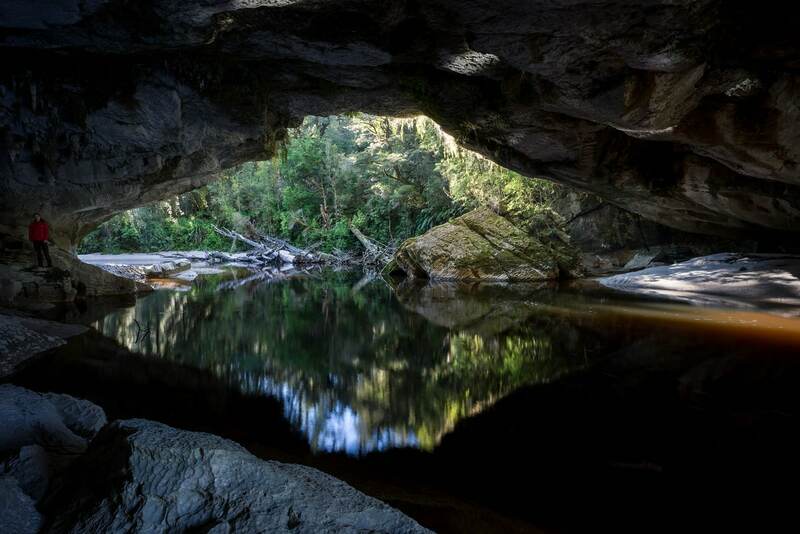 Oparara basin’s main attractions are certainly Moria Gate and Oparara Arch. While the former is large, the latter is huge and more like a cave. The following image shows me (to the left) inside of Moria Gate.